Around a blazing fire in the ‘Namgis Nation Big House on Tuesday, British Columbia Premier John Horgan told members and hereditary chiefs from eight Indigenous nations that he would honor the provincial government’s campaign promise to protect wild salmon, and meet with a delegation from the nations to continue discussions. But Horgan did not commit to the nations’ main demand to revoke licenses from fish farms operating in their waters. Six of the nations are six weeks into occupations and protests of two commercial fish farms off northern Vancouver Island. The nations say they’re not moving until the fish farms do. Occupation leaders from the ‘Namgis, the Mamalilikulla, and the four nations of Musgamagw Dzawada’enuxw say the fish farms — run by Norwegian aquaculture company Marine Harvest — do not have permission to operate in their territorial waters. They, and the hereditary chiefs of the Tlowitsis and Mumtagila nations standing in solidarity with them, are calling for the eviction of fish farms throughout the Broughton Archipelago. The activists say farmed Atlantic salmon are causing harm to nearby native Pacific salmon and other animals on which they rely. More broadly, the stand is about who holds the legal rights to these waters. 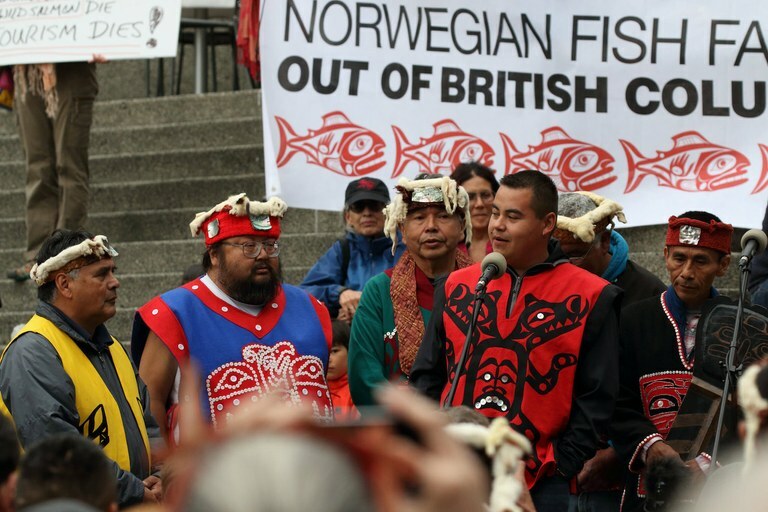 Members of First Nations at a rally in Vancouver, B.C., protest Norwegian fish farms in September, 2016. Marine Harvest operates within the territories of 24 Indigenous nations, and company spokesperson Ian Roberts says they have formal agreements with 15. But in the Broughton Archipelago, Marine Harvest bought its tenure licenses from non-Indigenous people. “It’s a legal business that has all licenses to operate,” says Roberts, referring to permits from both the province and Fisheries and Oceans Canada. Yet many First Nations whose territories lie within the borders of British Columbia never ceded their lands to the province or country through treaty or war, and they consider their rights to their lands and waters continuous and intact. Eric Joseph, a hereditary chief of the Musgamagw Dzawada’enuxw, says a string of recent First Nations legal victories has laid the groundwork for Indigenous nations to argue that the provincial and federal governments do not have the right to grant companies tenures in their lands and waters without their consent. One, the 2004 Haida decision, says the Crown has to consult and accommodate First Nations prior to using their asserted Aboriginal title lands, even if their title has not been proven in court. Another, the 2014 Tsilhqot’in decision, was the first declaration of Aboriginal title in Canada, and recognized the Tsilhqot’in’s claim to nearly 2,000 square kilometers of British Columbia’s interior. First Nations have also been gaining a stronger political profile through ongoing public pushes such as those around the Truth and Reconciliation Commission of Canada. Joseph says with the New Democratic Party in power in British Columbia, and a number of First Nations peoples holding office in provincial and federal government, the fish farm occupiers are hoping to capitalize on the current political climate. Chief Ernest Alfred from the ‘Namgis nation and an occupation organizer echoes this sentiment, arguing that he and his fellow occupiers are not protesting Marine Harvest’s salmon farm. “We are here asserting our Aboriginal rights. It is in our authority to monitor what’s happening in our homelands,” he says. But the extent to which the nations can actually assert control over the water in their territories has yet to be settled. Indigenous nations argue that governments can't permit fish farms without their consent. In 1997, the landmark case Delgamuukw v. British Columbia said that for a nation to assert a claim of Aboriginal title to their territory, they must demonstrate their intensive use of the area before and at the time when the Crown asserted sovereignty in 1845. 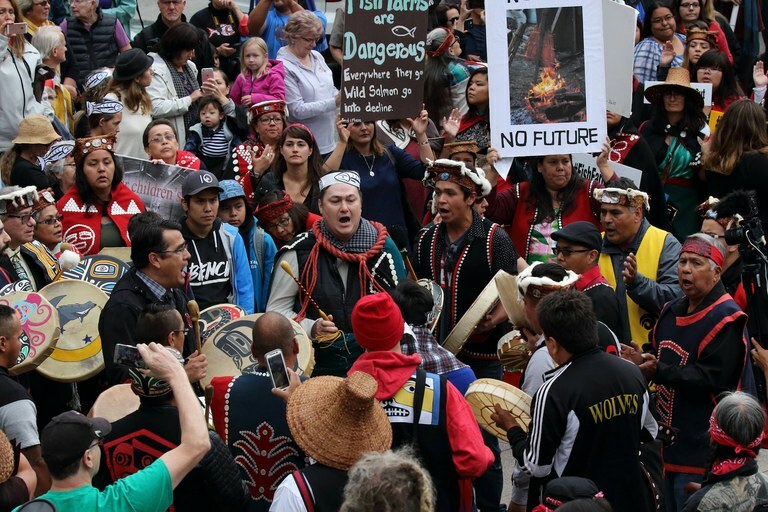 “Although most nations filed their original Delgamuukw writs to include marine and fresh water areas, it hasn’t been fought through court yet,” says Drew Mildon, a partner at Woodward & Company who worked on the Tsilhqot’in case. Mildon does not advise the nations in the Broughton Archipelago, but he expects the nations would be able to meet the requirements to claim the offshore waters. Doing so through the courts, however, would be costly and time consuming. In the meantime, wild salmon are struggling, and Marine Harvest sees itself as caught in the middle. “If the nations within the Broughton Archipelago feel that they want to have discussions with the governments around rights and title, then we encourage First Nations, provincial, and federal governments to have these important discussions, so they can provide clarity to the company on its operations,” Roberts says. Yet the ‘Namgis, Mamalilikulla, and Musgamagw Dzawada’enuxw nations’ rejection of Marine Harvest is only one example of how BC nations are wielding their assertions of sovereignty. North of the Broughton Archipelago, the Kitasoo/Xai’xais nation in the tiny town of Klemtu has a very different relationship with Marine Harvest. The company and nation have been partners since 1998. Klemtu has been a fishing industry town for a long time, says Ben Robinson, CEO of the nation’s economic development corporation. In the 1930s, the nation leased land to a fish processing plant, where some Kitasoo/Xai’xais people worked until it shuttered in 1969. Unemployment soared, so the nation built its own plant in the 1980s to process wild-caught fish. But fish stocks were in decline, so in 1987 the nation started farming fish. When salmon prices dropped in the 1990s, the Kitasoo/Xai’xais realized they needed to scale up or lose their business, so they sought a partner. Today, Marine Harvest leases tenures from the Kitasoo/Xai’xais. In exchange, the fish are processed in the nation’s facility in Klemtu, rather than the company’s own processing plant in Port Hardy, employing about 60 people — a significant portion of the workforce in a town of about 380.